Spring is finally starting to feel like spring! With temperatures above 15 degrees Celsius, we have an unbelievably warm and sunny weekend on the horizon to end our ski season. 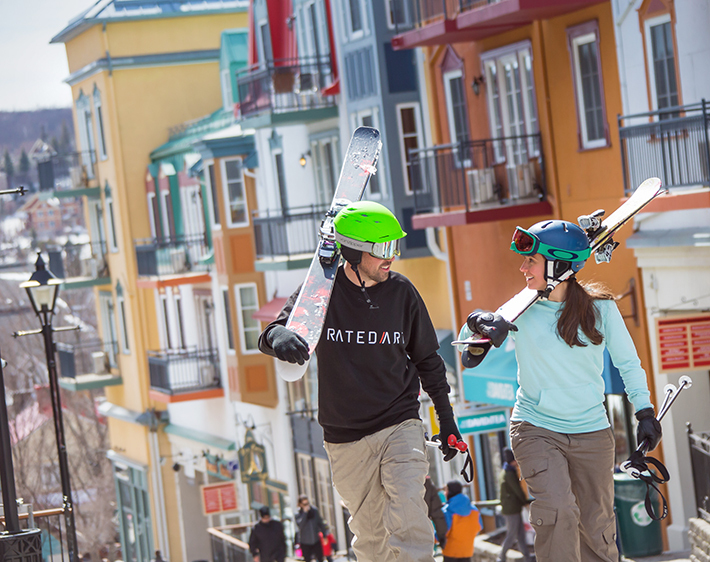 Celebrate our last two days on the slopes with us, April 16 and 17, and enjoy the barbecues on the terraces of both the Grand Manitou at the summit and the Fourchette du Diable at the north side base. More than 60 trails will be available this weekend via the Flying Mile, TGV, Duncan, Expo, Cabriolet and Magic Carpet lifts. Spring conditions are at their best with a nice soft snow cover. A perfect end of the season workout for your legs! Entertainment-wise, stop by the Place Saint-Bernard to soak up some rays and enjoy the music of DJ Bubu from 12 am to 6 pm, Saturday and Sunday. There will also be a show by Marc Parent accompanied by a saxophonist on Saturday from 3 pm to 4:30 pm! For this last bonus weekend, adult tickets are on sale for $ 49.99 online and at the ticket counter. Kids? They ski for free! One child 12 and under accompanied by a paying adult can ski for $ 0 on both days!